Ed Bedrick Autographs is proud to present a wide selection of licenses, some of which include... The Avengers, Betty Boop, Elvis, Harry Potter and The Hobbit and many more. I will also be adding a wide range of Disney products including The Classics, Pirates of the Caribbean and Tim Burton's Nightmare Before Christmas plus Disney/Pixar movies Cars, Finding Nemo and Toy Story! I am pleased to say that these products are hand crafted, right here in the USA. The FilmCell presentations are double matted, and include 35mm clips/strips of film that are individually selected from the movie. 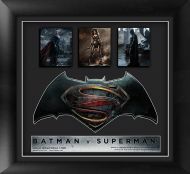 They contain a mini movie poster or unit photography, and a descriptive plaque including: item name/logo, licensing/trademark and limited/special edition details. The presentation also includes official embossed/foil certificate of authenticity, and is mounted in a stunning frame.